Do you want to learn how to monetize a blog? What do you see front and center every time you go to a live concert? That’s right – the merch table. Musicians and entertainers know that branded merch (merchandise) is a super profitable way to build their following and develop a revenue stream. Their fans WANT to buy merch that shows off their fave bands and brands – and entertainers want the publicity and income that comes from selling clothes, books, hats, and more. For some entertainers, the merch they sell overwhelmingly drives their business profits. As a blogger, you might be wondering if you can capture your blog’s fans in the same way. The answer is yes! Thanks to modern technology, it’s super easy to make your own blog or Youtube merch – and add it as an income and side hustle to help your blog become more profitable. Why Should I Learn How to Monetize a Blog with Merch? What Type of Merch Can I Sell? I’m Ready to Sell Some Blog Merch. What Do I Do? What questions do you have about making merch and physical products for your blog? Leave a comment below! It’s profitable! Every month, I clear over $1,000 in profit, just from the graphic designs and merch I sell – and I never touch any of the products. In some cases (see below) you may need to offer some customer service; in others, you are paid a royalty for your designs and never even need to upload a tracking number. You can set the prices for your products, so the sky’s the limit on what you make from it. It’s a step in your purchasing funnel. If you offer your readers and customers higher priced courses and products, adding some merchandise at a lower price point can increase the likelihood that they’ll buy later. Your audience loves you and wants to show the world by wearing or using products branded with your logos and designs. It’s easy and doesn’t have to cost you anything up front. 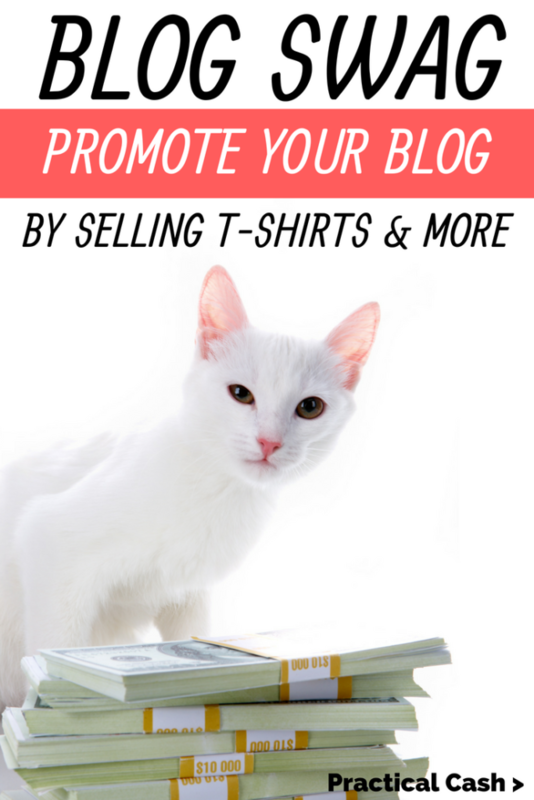 When you think of selling blog-related merchandise, you might envision your garage lined with stacks of t-shirts and you slaving away in the basement, screen printing designs while your children sleep. I wouldn’t recommend that! There are much easier ways to add merch to your blog without much hands-on effort. What type of blog merchandise do I want to sell? Do I want to sell it directly on my blog or do I want to open a web-based store, like Etsy or Shopify? Do I have a small following or a large following (ie, a few orders or lots)? How do I see myself marketing my products – will I be adding links to my merch to every page, sending it out in an email, or marketing it on Twitter/social media? Do I need a “set it and forget it process” or am I willing to do some customer service or manual order entry? If you are a graphic designer, selling merch on your blog should be especially easy. The hardest part of this process is coming up with a great design! 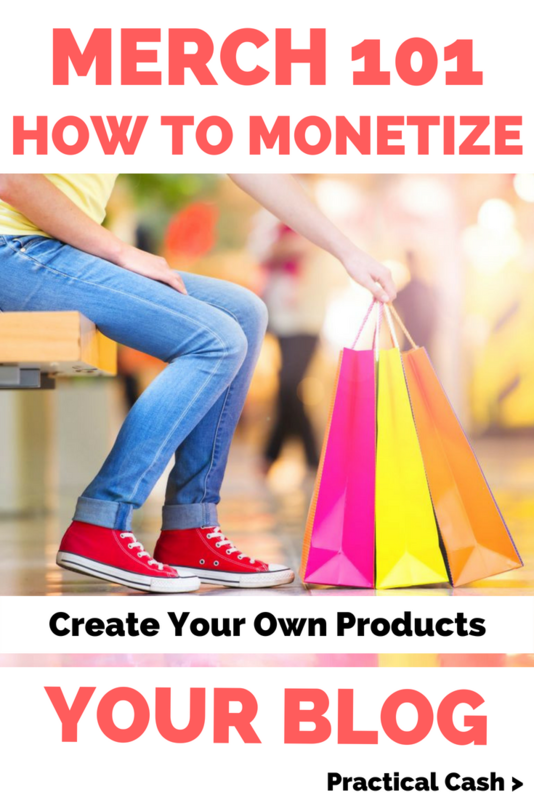 But even if you have no graphic design skills, you can easily learn how to monetize a blog and hire out the graphic design work necessary for creating a merch side hustle for your blog. Or you can use automatic graphic design services to create your own products like Picmonkey, Canva, and Make-Merch. There are basically two strategies to selling merch on your blog. To get started, sign up for an on-demand printing service. I use and like Printful. In this model, you create your graphic design and put it on a product. When a customer orders something, the printing service puts the design on a blank item and ships it directly to your customer. You typically charge the customer for the item and shipping at the time of the order. The other super nice thing about Printful is that it’s free to sign up, no monthly fee, and there are no ordering minimums in most cases. So even if you just want a blog-branded t-shirt for personal use or for you and your friend to wear to a conference, you can do that easily if you have a design. There’s even a discount (basically at cost) to order a certain number of test products for yourself. The pros of this model are that you have a lot of control over the process and you have a significant number of products to choose from to offer your customers. I’m a very happy customer with Printful’s print on demand service (which is integrated with my Etsy store) and they are very responsive to any issues with printing. Their orders ship out quickly and professionally (I’ve only had one or two day-late orders in over 1,000). Another benefit of Printful for learning how to monetize a blog is that they offer helpful mockups for each item and you can repurpose each design on multiple products. You can create one design for a shirt, then upload it to a hat, too. Printful will give you a graphic file you can use on your website to market the design. Companies like Printful work with, or integrate with, some popular online shopping platforms, such as Etsy, Woocommerce, Gumtree, and Shopify. If you anticipate just a few orders for your blog merch, you might simply sign up for a Printful account and manually enter the shipment orders when they come in (you will still need a payment processor though). If you are a smaller blogger and just anticipate a few blog merch orders, I’d create a blog Etsy store and integrate it with Printful. Printful has loads of helpful videos online to help you with that process. You could direct blog readers to your Etsy store, and once it’s set up, your orders will be automatically submitted to Printful when they arrive, so no manual entry will be necessary. You’d just need to answer any questions from customers. But if you have a huge following, want to learn how to monetize a blog, and anticipate that lots of people will buy your products, it might make sense to create a dedicated Shopify or Woocommerce store for your merch that integrates with Printful. That way your orders will be automatically sent to Printful without manual entry. You would simply need to deal with any customer service issues that arise. I highly recommend Printful to learn how to monetize a blog after working with them for more than 18 months. You can set your prices for whatever you want and as long as you’re above the base price and shipping cost, you’ll profit. They do not take a percentage of your profits, although Etsy charges for each listing you create and Shopify and other webstores do charge as well. If you want a totally hands-off approach, another option is to sell your merch and receive royalties from an on-demand printer like Merch by Amazon. In this model, you create your design and upload the design to a database. When the customer orders something, the printer makes the design and sends it to the customer. In this model, you aren’t charged for the blank item and shipping, but you receive a royalty for the product (kind of like if you sell an ebook). You receive the royalties when the item ships or on the schedule designated by the printer (Merch by Amazon pays monthly, as does Redbubble). Redbubble, Zazzle, and CafePress are popular examples of on-demand printers that pay royalties. The nice thing about using Merch by Amazon is that buyers have a lot of trust purchasing from the Amazon platform. They are extremely comfortable putting an item in their Amazon shopping cart. And Merch by Amazon encourages designers to drive traffic to their products. To sell or market an item, you can simply put an image or link in your blog or email and send the customers straight to Amazon (and even receive Amazon Affiliates income as well). You may be on the hook for returns. Amazon recently started removing royalties for returned items, regardless of reason. You have limited product offerings. Redbubble, Zazzle, and CafePress offer loads of products. However, Amazon is newer to the print-on-demand space and only offers T-shirts, long sleeve tees, hoodies, sweatshirts, and popsockets. You may have to wait to be accepted to the program. Merch by Amazon requires an application process that can take from days to months. You may be turned down. Just two final notes about how to monetize a blog. As you build your blog merch store, you may want to consult with an accountant about the sales tax issues associated with selling physical products, as they often differ from selling digital downloads. In addition, you’ll want to be clear on the ramifications of selling and shipping products internationally (VAT tax). It’s extremely fun to see your blog merch in physical product form. But please educate yourself about the pitfalls and problems associated with using copyrighted images and trademarked phrases on your blog merch. For example, don’t upload Star Wars themed memorabilia with your blog name or use the name of a famous entertainer to promote your blog merch. Both Printful and Amazon do not allow you to use images for which you do not hold the copyright. You can be kicked off any print-on-demand platform for violating copyright and trademark laws, so be sure you have the rights to use any image or words you incorporate in your designs. Thank you so much for this post! I have wanted to create cute t-shirts not only for me but for my readers as well. This is EXACTLY the info I needed. I have looked into a few print-on-demand sites, but am glad to hear your wonderful review of Printful. Thanks again! Jada, awesome! I have been really happy with them. They have FAQs and videos on Printful for just about anything you’d want to do, so it is a great user experience.